"Metaphysics: Objective Reality" "Nature, to be commanded, must be obeyed/Wishing won’t make it so." "The universe exists independent of consciousness"
"Epistemology: Reason" "You can’t eat your cake and have it, too." "Thinking is man’s only basic virtue"
"Ethics: Self-interest" "Man is an end in himself." "Man must act for his own rational self-interest" "The purpose of morality is to teach you[...] to enjoy yourself and live"
"Politics: Capitalism" "Give me liberty or give me death." 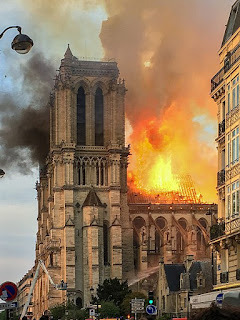 "If life on earth is [a man's] purpose, he has a right to live as a rational being"
Notable Commentary Before the fire had even been extinguished, close to $1 billion was pledged to rebuild Notre-Dame de Paris. The overwhelming majority of these funds came from non-government sources. (Image by LeLaisserPasserA38, via Wikipedia, license.) "Using taxes to preserve history is a violation of the rights of those who don't want to be forced to pay for that preservation." -- Bob Stubblefield, in "Letter: Preserving History Is Not a Function of Government" at The Aiken Standard. " I didn't see a forum where I thought this post fits well. If the moderators want to move it to another forum , that's okay. Anyway, I've been posting to this blog for a while, and believe some would find an interest in a couple recent ones. LeBron, Trump, Altruism Marconi #6 This is one of a series of 11 that I wrote while reading a biography of Guglielmo Marconi, the inventor of wireless technology and often credited with inventing the radio. The post refers to John Galt.